Home » With the Putin-Erdogan-Agreement sabotaged, Turkish Armed Forces prevented from entering the "Kurdish Corridor"
We have received information from the highest level of sources from both Russia and Turkey. These sources confirm vice versa the information. 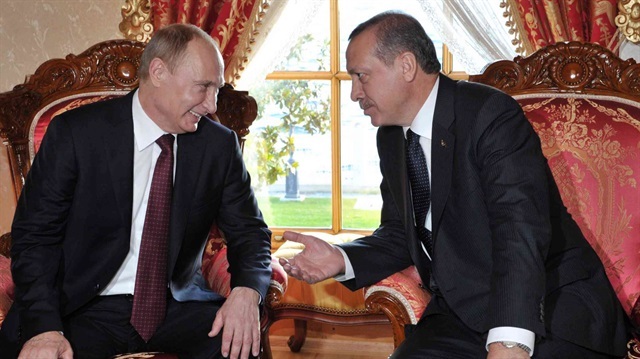 According to that, just a few days before the downing of the Russian SU-24 military jet, communication took place between President Erdogan and President Putin. In this conversation, Erdogan asked about Putin's stance towards a possible military intervention of the Turkish Armed Forces against the Kurdish Corridor in the north of Syria. Putin declared Russia would overlook this operation of the Turkish Armed Forces. He said "we would defend the territorial integrity of Syria in front of the cameras, but would not deliver any kind of military response." Thus, an agreement was reached between the two presidents. During his visit to the G20 Summit in Antalya in Mid-November, Putin was given detailed information by Turkey, including maps of the area. He commented with the words "the Americans want to give that region to the Kurds", thus indicating the centre of strategic developments in the region. The agreement between Erdogan and Putin meant that the Turkish Armed Forces would interrupt the so called "Kurdish Corridor" in the north of Syria, which has been supported by the US and Israel. Thus, a huge coalition including Russia was developing against the plan of a Kurdistan in our region. The US-built Kurdish Corridor would have been destroyed by the use of force. With the Operation of Jarablus, an area 98 km wide and 61 km deep would have been cleaned from ISIS. And the PYD would have been prevented from crossing to the west of the Euphrates, into the area between Kobane and Azez. According to information we have received from sources close to the Davutoglu Government, on the day the jet was shot, all preparations for this "Great Operation" were completed in the Chief of Staff in Ankara. All possibilities had been calculated and the order to start the operation was about to be given. On that day, the Deputy Chief of Staff of the US, Paul Selva was also in Ankara. And on the evening of that day, the Russian Foreign Minister Lavrov was to arrive in Turkey. The agreement that was "stabbed in the back"
This agreement would have changed the balance in the Middle East. It was not realized due to the downing of the jet. After the incident, Putin declared, "we are stabbed in the back", referring directly to this agreement between him and Erdogan. Moscow considered it a "treason" that the Russian jet was shot down meanwhile it was agreed that the Turkish Armed Forces would interfere into the US-Israeli Corridor. When after the incident the Erdogan-Davutoglu government consulted immediately the NATO, instead of contacting the Russian authorities, the crisis deepened. Not only Russia "was stabbed in the back". Also Turkey's fight for national unity and it's economic interests were deeply harmed. Today, the Davutoglu government on the one side declares it will not allow the separatist organization to cross to the West of the Euphrates, but on the other hand is incapable to take any military action due to Russian dominance of the area. 2) The Turkish Armed Forces' operation to Jarablus has been postponed. Turkey has lost its ability to conduct ground and air operations on the Syrian border. 3) The separatist terror organization PKK and its political arms have gained space to manoeuvre in Moscow. A cooperation between the Russian and Turkish Armed Forces against reactionary and separatist terror groups has been stopped. 4) Our economic relations with our most important trade partner, Russia, have been severely damaged. Beginning with the export sector, tourism, construction, agriculture, the whole Turkish economy has received a great damage. The cancelled economic agreements total to a value of 83 billion dollar. And today, Turkey needs to find 250 billion dollar of debt. 5) Turkey's possibilities to cooperate with regional countries like Syria, Iran, Iraq and Azerbaidshan have been limited. As an instrument that builds upon regional conflicts, the PKK faces new opportunities. 6) Those who shoot down Russian jets, find themselves in the pelvic are. The tension between Russia and Turkey constitutes a fertile ground for future risks concerning our national security. To defend its national unity and develop its economy, Turkey needs to cooperate with its neighbors, beginning with Russia. Russia is the most important partner for Turkey to stop the US/Israeli plan to found a Kurdistan. Again, Russia is Turkey's most important economic partner. The common interests, both in the area of security and in the economic field, are of strategic character. To realize our country's unity and develop an economy of production are the two big goals for Turkey. For both, cooperation is needed with Russia, China, the Central Asian countries and our neighbours. With its animosity against Russia, Syria, Iraq and Iran, the Erdogan-Davutoglu government not only leads Turkey into a path without solution, it also puts our country's security at risk. It is destroying our country's possibilities to escape the swap of debt. In these circumstances, the Patriotic Party (Turkey) is proceeding with the realization of its program of Union of West Asia. The Patriotic Party (Turkey) asks for the government responsibility to realize our country's unity and to establish an economy of production. We ask our nation for the authority to govern.